Our classic 12 oz hand-poured soy candle is nestled in glass jar with an aluminum lid. 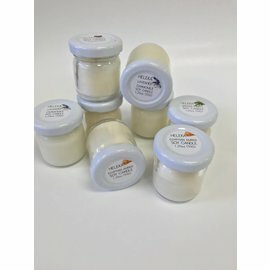 US Grown cherry wood wick sizzles softly releasing intoxicating fragrances that will gently fill your home with beautiful and inviting fragrance. Hand-poured in micro batches to ensure each candle is handcrafted with careful attention to quality and detail. Our fragrances have been infused with essential oils and are carefully selected for their ability to fill a room with their beautiful scents. As with every product we create, our candles are phthalate-free so you can make confident, intelligent choices about the fragrances you use in your home without comprising your health. Cucumber Mint - Subtle and fresh cucumber blends with a beautiful herbal mint. Releases a fresh, clean, uplifting scent throughout your home. Egyptian Amber - Abundantly infused with essential oils, this herbal blend is sultry, sensuous, and complex. Amber, musk, sandalwood, vanilla, jasmine, lavender and orange create a seductive symphony of fragrance. Lavender Chamomile - Intricate, soothing, calming, and relaxing scents of two of the most beautiful aromatherapy essential oils provide a gorgeous herbaceous-floral and serene fragrance. Created by Heleka in Chichester, New Hampshire. "HELEKA's roots began decades ago, during my early teen years when I began smuggling groceries out of my mother’s kitchen to make facial masques, deep conditioning hair treatments, and other natural indulgences. Even at a young age, I knew that beautiful body care begins with nature. During the mid-1980s I studied esthetics and developed an intense fascination with the chemistry of personal care products. Today I use this personal knowledge to formulate products that contain lush, nutrient-rich ingredients from around the world. I carefully select my suppliers to ensure that my ingredients are of the highest quality, sustainably harvested, ethically traded in the marketplace, and never involve any type of animal testing."